Baahubali 2 Tickets Scam: Ahead of the release of Baahubali 2: The Conclusion, the fake online ticket websites are giving sleepless nights to the fans. It is a well-known fact that the film is all set to hit the screens on April 28th worldwide, and been creating a buzz not only in Telugu but all languages across the country. As the release date is approaching, fans have been searching for various online sites to get tickets for the first day. Few of them are on cloud nine for getting the tickets at a great discount. It is all because of the cyber crime, that ruling the internet since the past few days. Besides popular sites like BookMyShow and Just tickets.in, there’s a new web portal named www.newtickets.in, which has been selling the tickets for this second part Baahubali 2: The Conclusion. 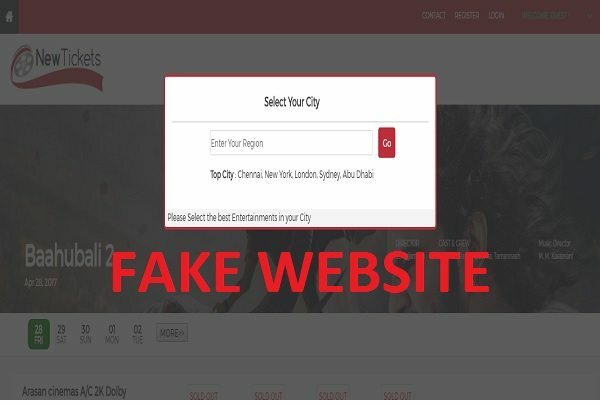 Sorry guys, those we are happy for purchasing tickets from this website, you should realize, that you are cheated by them, as this site is a fraud. For many shows, which already booked earlier will be seen as full empty in this full website. Some victims of this Cyber Crime have approached the police. A case has filed against the cyber crime in Coimbatore. Though they have received confirmation messages, it is officially declared by the police; they are all fake. Well, we have to see when the police will catch the cyber criminals and we wish none of the Baahubali fans won’t fall prey for these websites in coming days. Please be careful guys, don’t go for unknown or new sites.